GCATD members Rochelle Thompson and Gina Ruffin-Moore graciously offered to share their experiences at the 2018 ATD International Conference and their “brushes with fame” with GCATD. They noted that the 2018 ATD International Conference was outstanding. Pictured left to right: Gina Ruffiin-Moore, Marcus Buckingham, and Rochelle Thompson. 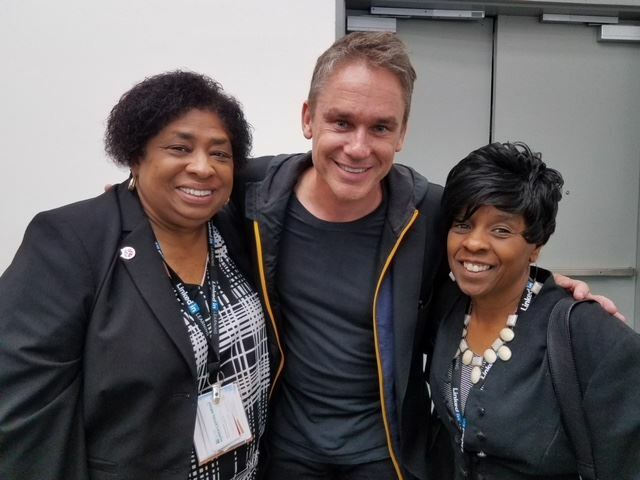 Rochelle and Gina heard from and met Marcus Buckingham (pictured left), a keynote speaker, and maneuvered through a crowd of about 11,000 to obtain front row seats to hear former President Barack Obama speak on the opening day of the conference. They also sat with Tony Bingham, President of ATD, during the press conference. They were lucky to be invited to attend all of the press conferences of each keynote speaker and with the ATD board! (Rochelle shares that none of this was planned prior to attending the conference and says that to tell that story would take another article). There were many learning tracks to choose, vendor booths to visit, numerous networking opportunities to meet people from various parts of the world, and the chance to hear A-listed key note speakers. It was an undertaking that Rochelle says she will never forget. Speaking to her experience at GCWW, Rochelle shares, “We at Greater Cincinnati Water Works are looking to revamp our Leadership Development Program. I attended workshops that provided valuable information that we can use to reformat our program. Other interests of mine were training delivery, talent management, learning measurement & analytics and instructional design. There were many session options to choose. All of those I attended proved to be helpful. I would be remiss to leave out the networking event at the Navy Museum. It was awesome! Great food, conversations, artifacts, and music. The 2018 ATD International Conference could not have chosen a better location. The weather was beautiful and the San Diego convention center was sized appropriately for the large crowd. There were lines, many of them, but they all moved fast. No one, and I mean no one, appeared shaken by the 4.5 earthquake which shook Southern California that Tuesday morning.” And, as a parting accomplishment, Rochelle shares that Gina’s persistence even found her meeting Barack Obama in the hotel workout facility, and she has a picture to prove it. All in all, it’s clear that there is more to learn from Rochelle and Gina about the ATD conference and the benefits derived it! If you have News Worth Knowing to share with your fellow GCATD members, please send with your name and contact information to communications@gcatd.org. Let’s keep learning together!